When constructing a residential or commercial building on dense sand is often difficult and can bring a variety of challenges. Sandy soil has naturally shifting characteristics; drainage through sandy soil further increases its shifting properties. This creates difficulty for contractors building structures on this type of soil. Without the proper densification, loose sand does not provide sufficient bearing for new foundations and structures. 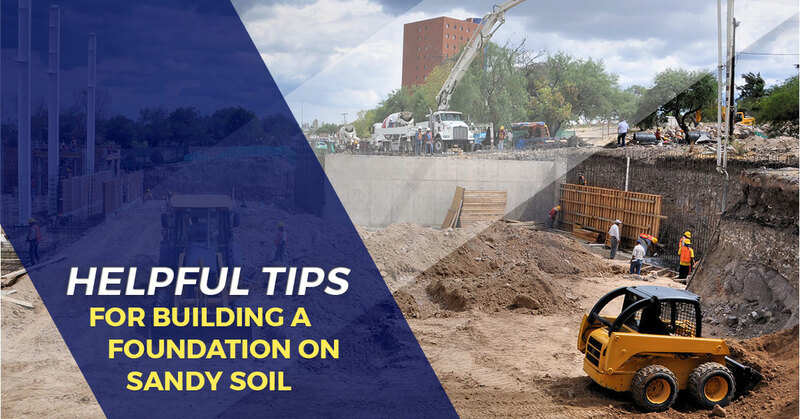 Because building on sandy soil is a challenge that many foundation repair contractors deal with, we put together some helpful tips to help you build a foundation that is safe and secure. There are various types of sand and all of them have distinct physical properties. Some types of sand act more as a gravel while others act more like silt. Before you get started working on a project, one of the first things you should do is determine what type of soil you are working on, and if it is sand that you are building on try to figure out which type of sand it is. A professional soil testing will help you develop the right solution for the installation of the foundation. A soil report typically provides a brief review of the geological history of the work area coupled with a reconnaissance report of the particular site and its surroundings. Without these reports, contractors have to basically make assumptions for the design criteria of the on-site soils. It is better to have a soil testing done before, rather than later after a foundation has settled. Ultimately, these reports help calculate the bearing capacity of the sand and also the depth and composition of other soils that are beneath the sand. Most types of sand can bear around 1,500 to 3,000 pounds per square foot. In order to determine how much load capacity you that is required, you need to first calculate the weight of the building. In addition to calculating the weight of floors and walls, it is important to keep in mind any regional incidental codes that can add to the overall weight. Once a soil report is obtained, the provided information can be used to craft a deep foundation solution. Underneath the sandy soil, is generally a harder and more cohesive soil. The properties of this soil make it easier to successfully anchor a building. When building on sand, it is essential to pay close attention to vibration. Too much vibration can damage the foundation and structure as if typically will cause sand to settle. A helical pier is a foundation pin made of steel that contains helices, just like screws. They are used to support structures, especially where soil conditions are challenging and make it difficult to install a traditional foundation system. Not only do helical piers minimize the amount of time spent installing a foundation, they also cause little disturbance to the soil and transfers the weight of the structure, to soils deep into the earth that would bear the load. This effectively removes sand from the equation as the pier is anchored deep in the earth. These are a great solution to eliminate vibration of the foundation and structure of the building. When it comes to installing a foundation, you want to ensure that you are using high-quality materials and products to ensure the job is done well and prevent any reworks. There are plenty of piering product suppliers out there, but none of them offer the level of product quality, service, and solutions that are offered by Magnum Piering. Magnum Piering has well over 35 years in the industry, which partly contributes to why we are one of the leading manufacturers for high capacity and high-quality steel piling products for deep foundations and foundation repair applications. We manufacture helical piers, push piers, helix foundations, anchors — just about everything that is needed for a foundation installation or repair job. Hopefully, these tips come in handy the next time you have to build on challenging sandy soil. Having proper materials and products for the job can make dealing with sandy soils far less complicated. If you are interested in making your foundation jobs easier by using high-quality steel piling products, be sure to get in touch with a sales rep at Magnum Piering. Our quality products are backed by top-notch support and service, To learn more, contact us today!